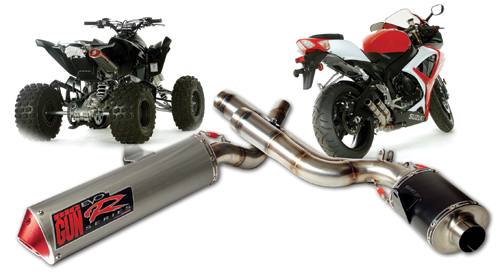 Big Gun Exhaust, Rancho Cucamonga, CA, a manufacturer of aftermarket exhaust pipes, has grown to become the third largest supplier in the ATV market. But such growth hasn’t come without challenges. Mike Young, owner of Big Gun and a championship motorcycle racer, began the company with the belief that he could outsource everything but the design of his product. Now, with 13 employees, as well as three at a powder- and ceramic-coating facility next door, Big Gun sells to dealers around the world. While Big Gun is ramping up inhouse production, Young still sees the importance of slow and steady growth to achieve the highest-quality product. 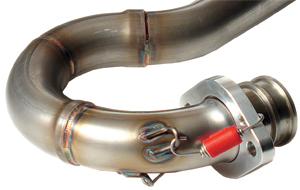 Before an exhaust system is ready for manufacturing, fixtures must be custom fitted from a finalized prototype. Considering that many pipes require as many as 16 fixtures, consistency and quality control in fixturing are critical to the company’s inhouse operations. “We need to be kicking out 200 to 250 units a week, and that’s not enough to meet demand, but we’ve got to take gradual steps,” he says. “We still have to outsource to one other shop, but we finish the products here. We double-check everything and then package and ship. Young credits use of the Dynasty 200 gas-tungsten-arc (GTA) welding machine from Miller Electric Mfg. Co., Appleton, WI, for helping the company approach its weekly goal of producing 250 performance pipes, made from 0.035-in.-thick Type 304 stainless-steel tubing. “The Dynasty got us up to 50 pipes per week right a,” he says, noting that further adjustments to the manufacturing process have allowed Big Gun to currently produce 150 units weekly. This closeup shows the weld bead and its relatively small heat-affected zone on Type 304 stainless-steel pipe. A small heat-affected zone helps to avoid warping and ensures precision fit and performance. 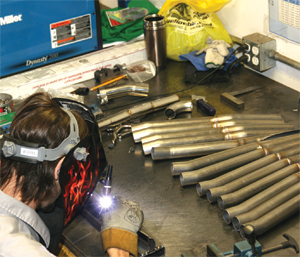 Because every pipe requires six to 16 fixtures, welding is the largest part of the manufacturing process at Big Gun. Following the prototyping and fixturing process, the system is welded—very carefully. Between these two steps, fitup and welding, the company has no room for error. 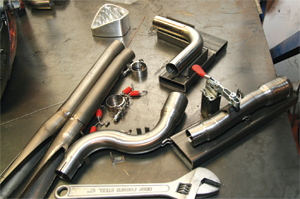 Each fabricated pipe must be identical and perform in exactly the same manner. Each fabricated pipe must be identically placed in the fixture in order to perform in exactly the same manner. The high-speed pulsing feature of Big Gun’s new welding machine constricts and focuses the arc, allowing operators greater control over arc stability and heat input, allowing parts to stay cool and avoid warping. The challenge of welding thin-gauge stainless steel involves achieving adequate penetration without overheating. Unlike other alloys, stainless steel does not adequately dissipate heat when welded, instead holding heat in the area of concentrated welding arc. Excess heat causes major problems, including warping, embrittlement and rust. Warping usually leads to costly part scrapping, and temperatures above 950 F cause stainless steel to become brittle, causing the alloy’s mechanical properties to fall short of required specifications. Excess heat also boils off stainless’ alloying elements and concentrates carbon, which remains trapped in the heat-affected zone as the steel cools. Given time, the area overloaded with carbon will rust, negating stainless steel’s best-known property. Where excess heat, loss of mechanical properties and warping are issues, pulsed welding can provide the solution. With pulsed gas-tungsten-arc welding (GTAW), the arc pulses between a high peak and low background current. The peak current provides good penetration while the background current allows the weld puddle to cool slightly, preventing warping, embrittlement and carbide precipitation. Higher pulsing—generally above 100 pulses/sec.—increases puddle agitation, which in turn optimizes grain molecular structure within the weld. High-speed pulsing also constricts and focuses the arc. This increases arc stability, penetration and travel speeds, and produces a small heat-affected zone. High-speed pulsed GTAW requires using an inverter power supply. Conventional GTAW limits pulsing to a relatively narrow range of 0.25 to 10 pulses/sec., where inverter technology enables pulsing to 5000 pulses/sec. Pulsed GTAW requires setting four variables: peak amperage, background amperage, peak time and pulse rate. Peak amperage, peak time: Determine good values for setting peak amperage in the same manner as setting maximum amperage values for regular DC GTAW: 1 A for every 0.001 in. of thickness. Peak time is the percentage of time during one pulsing cycle that the power source spends at the peak amperage (main amperage). With peak time of 80 percent and a rate of 1 pulse/sec., the inverter will spend 0.8 sec. at peak amperage and 0.2 sec. at background amperage. Increasing peak-time percentage adds more heat to the part, while decreasing reduces heat. As a rule of thumb, begin experimenting at 50 to 60 percent peak time. Background amperage: The background amperage is a percentage of the main amperage set on the machine. Thus, a machine set for an output of 150 A and background amperage of 30 percent produces a background amperage output of 45 A. Lowering the background-amperage percentage reduces the average heat input, while increasing it raises overall amperage. Notice how background-current adjustments affect weld-puddle fluidity. Use enough background current to shrink the puddle to about half of its normal size while still keeping the puddle fluid. When welding stainless and carbon steels, start by setting the background amperage at 20 to 30 percent of peak amperage. Pulse rate: The pulse rate is how many times the machine will complete one pulsing cycle in a time span of 1 sec. Increasing the pulses/sec. produces a smooth ripple effect in the weld bead, narrows the weld bead and adds a cooling effect. Reducing the pulses/sec. widens the weld bead. Slower pulsing also helps agitate the puddle and releases any porosity or gas trapped in the weld. Some beginning GTA welders use a slow pulsing rate—0.5-1 pulses/sec.—to help them develop a rhythm for adding filler metal. For welding carbon or stainless steel, use a rate of 100 to 500 pulses/sec., starting at 100 and working upward. Working at rates surpassing 500 pulses/sec. generally requires automated welding. In terms of welding alone, the Dynasty helps Big Gun achieve uniformity because, among other things, operators have more heat-input control, according to Frank Sison, head of manufacturing at Big Gun. The ability to fine-tune output parameters saves Big Gun significant time. Sison also notes the smooth starts associated with the GTA welding machine that assist in manufacturing gains at Big Gun. The Dynasty’s advanced inverter technology with Auto-Line power-management technology allows Big Gun to hookup to 120 to 460 V, single- or three-phase power with no manual linking, and reduces power draw. Information for this article supplied by Miller Electric Manufacturing Co., Appleton, WI. Tel. 920/734-9821; www.millerwelds.com.